As you may recall, the most recent SFPD Community Meeting with Ingleside’s Capt. 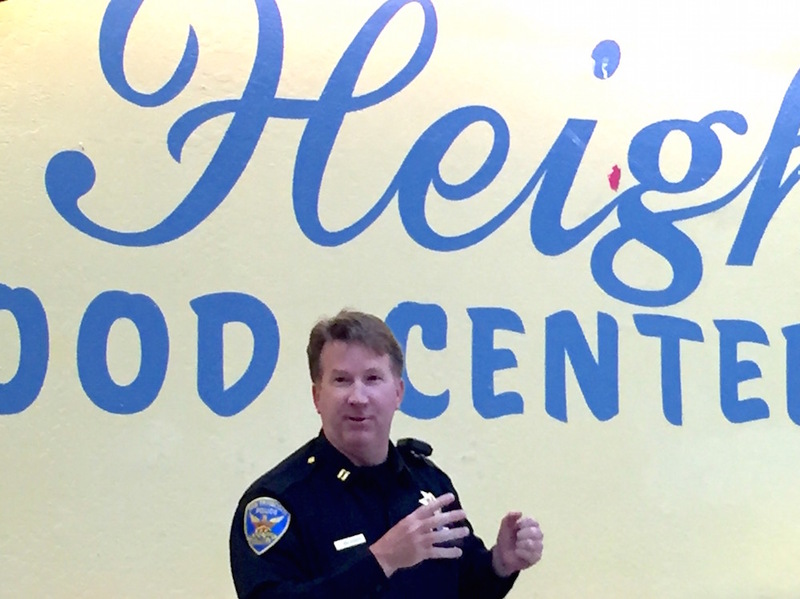 Joseph McFadden took place last week at the Bernal Heights Neighborhood Center (BHNC). Your Bernalwood editor was in attendance, and it was an informative meeting — as you’ll soon see. Notes taken by volunteer Edie, who is also responsible for any errors made below. Personnel: The Captain introduced Chris Schaffer (formerly from Bayview Station). Chris is one of three swing-watch lieutenants. He’s a dynamo and worked 8 years in the Bayview, and was formerly undercover. 1. Car Break-ins, House Break-ins, and Package Theft: There seems to be a high amount of recidivism now, where thieves are arrested and held briefly, then get out and do it over again. The holidays are coming, too, with increases in car and house break-ins, and package stealing. Package theft usually happens during the day. Ask delivery services not to leave packages if you’re not home – find a neighbor to receive them for you, or ask Central Pharmacy, or Daniel’s on Geneva. Also pay attention to anyone following Delivery trucks as they drop off packages. Thieves have been following the trucks, stealing the packages they deliver. Car break-ins happen most often late at night, so don’t leave packages, garage door openers, or any personal items in your car, either. Thieves use shaved keys or do a quick smash and grab, so take everything out. Some people even leave their cars unlocked with notes saying there’s nothing inside, so their windows don’t get broken. Car break-ins primarily happen at night–drug addicts take stolen goods to 7th and Market, get a little cash for them, get a fix, and do it again. Make it more difficult to break in or steal by using a club, and a thief will choose another car instead of yours. House burglaries usually happen after 9am. The thief comes to the door and rings the bell; if there’s no answer, they’ll kick the door in, or go around back to break in a door or window. So, if someone knocks, even if you don’t want to, answer so they know that you’re home and leave. 2. Ongoing problematic behavior by specific individuals: Bernal has a long-time resident with mental health issues who often threatens neighbors on the street. In ongoing situations, call for each incident: report the behavior, describe the person and the context, include days and times that incidents generally occur, plus any further details you have. Be specific. If you don’t get help when he threatens people, after 30-45 minutes, call the station front desk 404-4000 and ask for the Platoon Commander. You must also be prepared to stick around and talk to the police when they arrive. When you call in an incident, always ask for the CAD number so you can track response to your call. Around Alemany and Sickles: vandalism, graffiti, punctured tires. Silver at Mission: Lots of kids getting out of school and hanging around. Kids get robbed, steal from each other. Neighbors are trying to track the incidents and get a handle on the situation so they and police can be more effective. North Bernal: Neighbors say they are hearing gunshots more frequently now, mostly in the evenings, and recently there have been 2-3 incidents of people shooting guns off in the night, including at the Precita Park Cafe. Neighbors also say they’ve seen drug dealing in Precita Park, and a large and active homeless encampment at Cesar Chavez under 101. Captain’s response: Shots fired: Bayview and Mission gangs have been committing robberies in Bernal and Glen Park. There are 2 freeways to get quickly in and out, so groups move easily from district to district. If you hear shots being fired, Shot Spotter may catch it, but you should call 911 anyway. Even if you can’t tell where they’re coming from, if many neighbors call, they can track the movement and figure out where they are. Besides, you don’t know but that someone might have gotten shot. Precita Park Café window shooting is under investigation. Officers now think it’s not random, but might have something to do with an earlier altercation. 4. Deliberate reckless driving: At night, all over the city, groups get together in large open areas to do side shows – wheelies and other crazy driving. If you hear noise and can see the cars, get a license plate if possible. 5. Videos help to ID criminals and their cars. Please install video cameras, use them, and make copies of criminal activity to give the police. Police will distribute images of individuals and vehicles city-wide for officers to check daily. They may recognize then, and can keep an eye out for them as they patrol. 7. REMEMBER: when you describe someone, look for specific and distinct details (not a black hoodie, but the big eagle tattoo on his left arm) that would allow police to be sure they’ve got the right person. 8. Activity that happens really late at night often involves victims that are coming from gambling shacks. They’re watched as they leave with winnings or drugs, and someone takes it away from them. Police academy: 5 new graduates are training at the station now, and a new class will graduate in November. There should be five new classes next years. Numbers at the station are holding steady at 100. Halloween: Popular trick-or-treat corridors will have officers present to safeguard the kids. Community leaders: The Captain introduced the community leaders present at the meeting. Sierra Desalvia, Community Boards; Ailed Paningbatan, BHNC Director of Community Engagement; Ayanna Weathersby, BHNC Community Engagement Coordinator; Joelle Kenealey, Co-Chair of the Community Police Advisory Board (CPAB) and President of the Outer Mission Merchants and Residents Assoc. (OMMRA); May Wong, President of the Excelsior District Improvement Assoc. (EDIA); Grace Breyley, Co-Captain of the Curtis-Newton NWG; Edward Whitmore, South Bernal NERT Coordinator; Bobby Cochran, Sergeant at Arms, Holly Court Resident Council; Jon Shepherd, SFSAFE. Community Boards. Sierra Desalvia, Volunteer with the Community Boards Outreach Program. Community Boards is the oldest conflict resolution center in the US. A non-profit, CB provides confidential, affordable voluntary conflict resolution between two or more neighbors, groups, or businesses, in English, Spanish, Mandarin, and Cantonese. The mediators are trained volunteers, representative of the communities they are working with. If you’re unable to resolve a disagreement, call CB and tell them your side of the story. CB will contact the other parties, and if all concerned are willing and able to participate, will begin the mediation process. Resolutions can be oral or in writing, and must be made and agreed to by all parties involved. CB does not handle disputes where one or more party is unwilling to negotiate, if there are credible threats of violence, or if parties are not able to speak for themselves. Just so you know, this works for ALL city employees…the mayor, tax collector, public defender, your district supervisor. If you want to cut through some red-tape, this is a great way of going right to the source. I had a great interaction with Carmen Chu after getting the run around by her office they accidentally billed me for property taxes twice.